(MENAFN - ForPressRelease) Sowing Happiness introduces the biggest collection for iPhone 5S. Check out the latest additions at their website. Mobile covers are a must in this era. We hardly find someone who could carry their smartphones without a protective cover on to it. Such has become the importance for mobile covers and one definitely risks his or her mobile phone's long life if it is without a mobile protective case. Mobile covers provide protection to the mobile phone inside it from every sort of damage, dust and water, and hence keeps the smartphone durable. With the rising need of mobile covers have come the rising number of mobile covers providers both online and offline. While online shopping has proven to be far better than the offline counterparts, due to the hassle free experience and discount offers, people are also going more and more for online mobile cover sellers. Sowing Happiness is one such online merchandiser which sells printed mobile back covers at affordable rates to its customers. Sowing Happiness has followed the trend and has recently launched its exclusive assemblage of iPhone 5S model. The company is quite an experienced one in the industry making significant developments through customer satisfaction rates in the arena. According to them, what makes them different from the rest is their dedication to customer satisfaction. 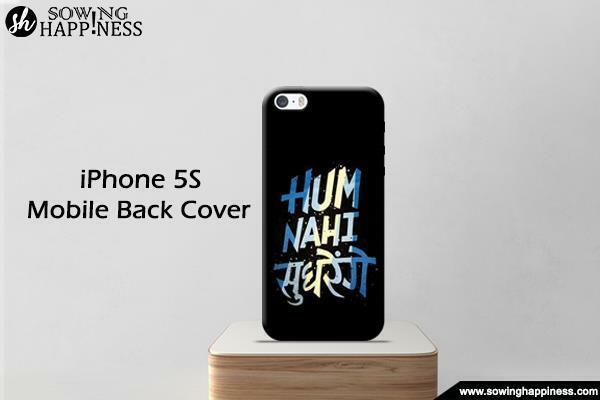 Sowing Happiness has launched different themes for its iPhone 5s mobile covers collection in the form of spiritual or religious based, sports based, and quote based, and other printed cases. By demarcating the covers in such a basis, the team at Sowing Happiness aims to give the customers an easy filter option and thus a convenient mode of shopping. Elaborating on the development, the CEO of Sowing Happiness, Mr. Binoy Balan says, our customers is our priority and we do not want them to be disappointed about the service we provide. Hence, we strive to achieve the best shopping experience to them. This is also the reason behind our motto- to sow happiness for our customers. We provide our merchandises with superior quality components as well so that, we carry our network forward with our customers' support". Adding more to the services at Sowing Happiness, it also includes a replacement policy of 15 days with a "no question asked" policy and also a lifetime warranty on the print of the back cover. About the website- Sowing Happiness is a budding company established in the year 2015. It is rated as one of the best and among the top printed merchandise providers in the country. The goodies they provide is not limited to mobile back covers. It also includes printed t shirts, sweatshirts, and fast charging data cables, mugs and sippers. Their motto is - "to sow happiness for you to reap it". The company is considered to be one of the leading e commerce sites in India.